The female prisoners who underwent horrific surgical experiments at the Ravensbrück concentration camp became known as 'the Rabbits.' Kelly's novel rotates portraits of two real-life women involved in this story (an American named Caroline Ferriday, who led a crusade on behalf of the survivors, and Herta Oberheuser, the Nazi surgeon who performed the gruesome operations) with that of a fictional Polish woman, Kasia, loosely based on two of the actual Rabbits. As a literary work, Lilac Girls is uneven. Caroline’s story is the most vividly told of the three, packed with details that take the reader smack-dab into upper-crust parties and old-money country homes where women casually carry Schiaparelli bags. Midtown Manhattan at mid-century comes alive. Kasia’s story is the most gripping and disturbing, although as a character Kasia is not as well-developed as Caroline. The Herta story is the weakest of the three; while it made sense for Kelly to include her so readers could learn more about the Ravensbrück camp atrocities, her character is the least explored ... But no matter. This is the sort of historical fiction-meets-quasi-romance novel that will have book clubs salivating, and for good reason: It’s a compelling, page-turning narrative .. Lilac Girls falls squarely into the groundbreaking category of fiction that re-examines history from a fresh, female point of view. It’s smart, thoughtful and also just an old-fashioned good read. Details of fundraising efforts, immigration issues, Reich politics, camp life, and interpersonal relationships make for a gripping read that lingers well after the book ends. Offer this to WWII aficionados, biography fans, and book clubs. 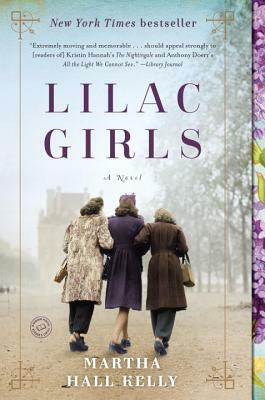 Although Kelly’s novel is clearly the result of exhaustive research, the deficiency in Lilac Girls rests, unfortunately, with its characters. Caroline comes off as a dilettante, and Kasia starts out as something of a Joan of Arc, a passionate if naïve operative in the Polish resistance whose feelings of guilt when she takes down her entire family after a botched assignment aren’t plumbed in any meaningful way. Herta, arriving at Ravensbrück oblivious to its real purpose, is aghast when she learns its secret. But the next time we see her, she’s encased in ice: heartless, cruel, infuriating. What happened? Like everyone else, she’s a stereotype with no narrative force of her own. Postwar, things only get worse ... Lilac Girls is an earnest attempt to tell the Rabbits’ story, but it sinks ­under the weight of its own ambition. What did you think of Lilac Girls?